There used to be an old home remedy where you would massage an infants head with sweet oil (olive oil) in order to encourage the hair to grow. It doesn’t work. There is nothing in olive oil to stimulate hair growth. In fact, all you are liable to accomplish is upsetting your infant – and greasing up their head like a huge Idaho potato. My aunt came into the world kicking and screaming (like all infants)…. and bald. The kicking and screaming eventually abated – but the baldness remained. And by the age of 2, the hair still had not arrived. Clara and the other family members knitted and crocheted little sock hats for her little shiny head, but the follicles just weren’t cooperating. This distressed my mother greatly – the thought of her sister growing up – going through life bald as an egg – with a wardrobe full of knitted and crocheted caps to cover her shiny, pink dome. And when she was about six, she overheard a couple of women in Marietta talking about the head oiling phenomena and they swore by it. Could this be? Could it really be so simple? My grandmother came into the kitchen to find both her girls sitting on the floor, a 5-gallon bucket of lard between them, my mother’s hands caked with grease and my aunt’s head slathered with lard… her hot little head melting the greasy miracle cure into glistening rivers and intermittent stray globules of fat flowing into her ears and eyes. I can’t say if it was a failure or success…. but my aunt’s hair started to grow later that year. 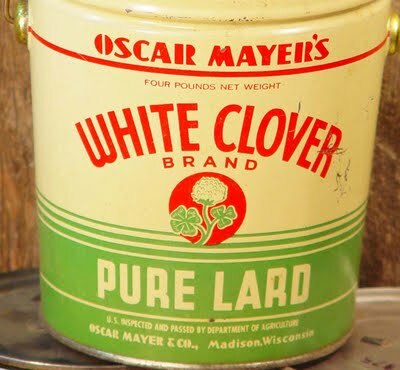 The South has always has a love affair with lard. (hence, the 5-gallon bucket in the kitchen). Nothing fries better, makes greens and beans taste better, or bakes better than pristine, white pig fat. 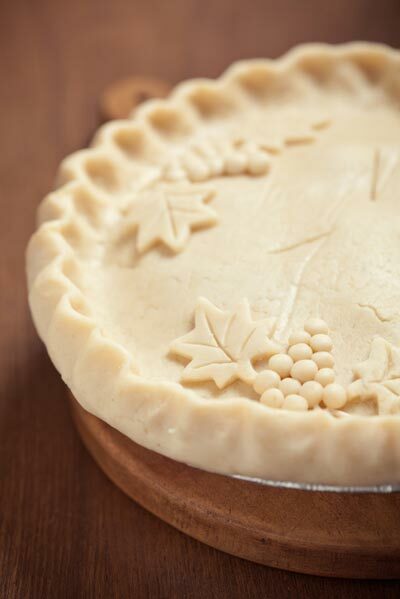 Ask any baker and they will tell you, nothing makes a flaky, crisp pie crust like lard. Go ahead…. I’ll wait a minute for the gasps and shrieks of horror to stop……. Why then, if for all the goodness that lard adds to cooking, have we stopped using such a versatile, low cost, natural ingredient? For that – you can thank Uncle Sam. 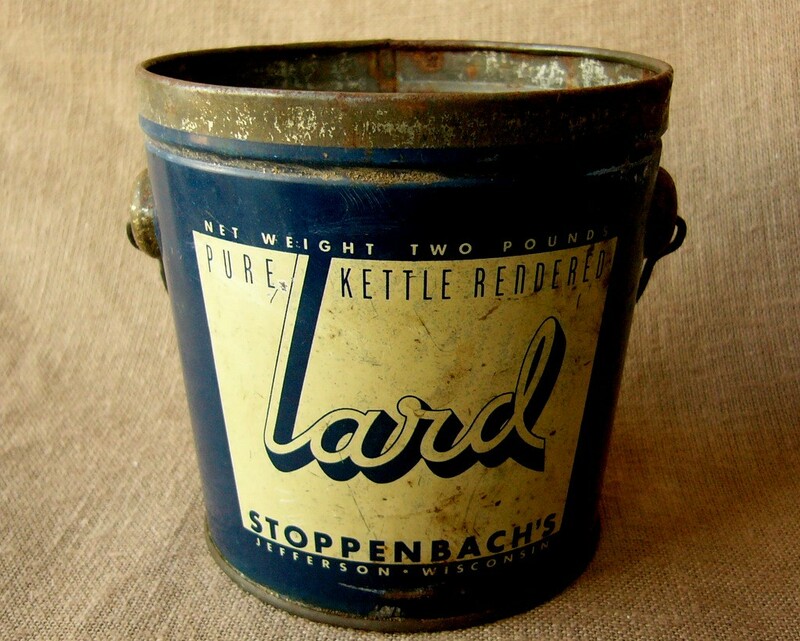 For you see – it isn’t that lard is all that unhealthy for you. The war effort needed fat to grease the machine.. ummm… make bombs. And, while the vegetable growers had produced a hard shortening that they felt would work in that case – it just didn’t have the same oomph as animal fat. So the answer was to pry they coveted lard buckets out of the hands of the citizens and substitute it with the inferior vegetable shortening. They did that with an orchestrated smear campaign. Sadly, this just isn’t the case. 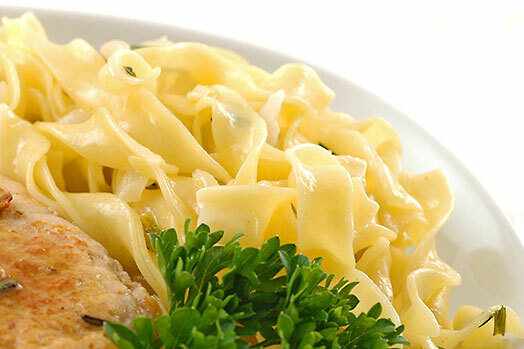 Italy – a country that still boasts a very low heart disease – cooked exclusively with lard and butter. You heard me right… LARD.. not olive oil. Olive oil was produced strictly as an export item. Until tourism picked up in Italy, lard was the lubricant of choice. Olive oil only became part of the cooking world because the tourists expected it. And what about those south sea islands where animal fat is the only grease available… zero heart disease. Truth be told, there is no correlation between animal fat, cholesterol, and heart disease. Oddly, the only studies that have been funded were sponsored and championed by… you guessed it.. the Vegetable / Plant Oil producers. This includes true vitamin A or retinol, vitamin D, vitamin K and vitamin E as well as all their naturally occurring cofactors needed to provide maximum benefit. Butter is America’s best source of these important nutrients. In fact, vitamin A is more easily absorbed and utilized from butter and lard than from other sources. Called The Wulzen Factor, this compound is present in raw animal fat. A researcher discovered that this substance protects humans and animals from calcification of the joints – degenerative arthritis. It also protects against hardening of the arteries, cataracts and calcification of the pineal gland. Butter from pasture fed cows also contains a form of rearranged CLA, which has strong anticancer properties. It also encourages the buildup of muscle and prevents weight gain. CLA disappears when cows are fed even small amounts of grain and processed food. This type of fat protects against gastrointestinal infections, especially in the very young and the elderly. For this reason, children who drink skimmed milk have diarrhea at rates three to five times greater than children who drink whole milk. Butter contains about 12-15% short- and medium chain fatty acids. This type of saturated fat does not need to be emulsified by bile salts but is absorbed directly from the small intestine to the liver, where it is converted to quick energy. These fatty acids also have antimicrobial, antitumor and immune system supporting properties, especially 12 carbon lauric acid, a medium chain fatty acid not found in other animal fats. Highly protective lauric acid should be called a conditionally essential fatty acid because it is made only by the mammary gland and not in the liver like other saturated fats. We must obtain it from one of two dietary sources – small amount of butterfat or large amounts of coconut oil. Four carbon butyric acid is practically unique to butter. It has antifungal properties as well as antitumor effects. These occur in butter in small but nearly equal amounts. This excellent balance between linoleic and linolenic acid prevents the kind of problems associated with overconsumption of omega-6 fatty acids. 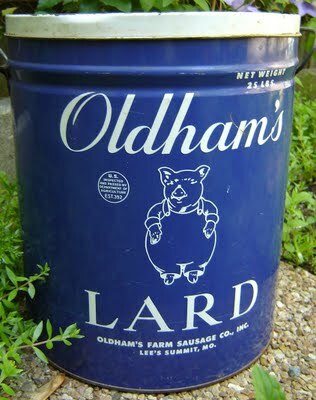 Depending on how your lard pigs were fed, they also contain hight levels of omega 3 and 6. Lecithin is a natural component of butter and lard that assists in the proper assimilation and metabolization of cholesterol and other fat constitutes. Cholesterol is also needed to produce a variety of steroids that protect against cancer, heart disease and mental illness. Many trace minerals are incorporated into the fat globule membrane of butterfat, including manganese, zinc, chromium and iodine. In mountainous areas far from the sea, iodine in butter protects against goiter. Butter is extremely rich in selenium, a trace mineral with antioxidant properties, containing more per gram than herring or wheat germ. Sprinkle with water a little at a time. Mix with fork until flour is moist. Press into a ball and turn out onto a floured board. If making a two crust pie divide in half. Fold pastry in half and move up to pan. Sprinkle the top crust with a little sugar to evenly brown. In a large bowl, mix the egg yolks with 3 2/3 cups of the flour. Add the lard, cream, salt, and baking powder. With a ruler, mark off 3/4″ and roll the pizza cutter down the edge of the ruler – continue until you have marked and cut all the dough. In medium mixing bowl, beat lard until fluffy. 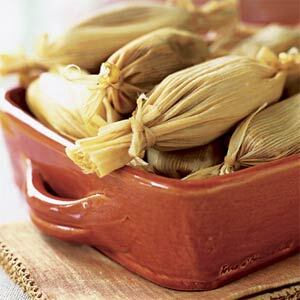 Beat in corn, masa mix, baking powder and salt to make a soft, moist dough. Beat until dough is soft and fluffy, set aside. Drain husks and pat dry. Tear 3 husks lengthwise in 1/4-inch strips. Place 1 husk on work surface. Place 1 tablespoon rounded spoon of dough in center and spread slightly. Add 1 cheese cube and 1 tablespoon of chicken mixture, and then 1 teaspoon dough. Fold one of the long sides of the corn husk over the filling. Fold pointed end toward center. Fold straight end over pointed end. Repeat until all 24 are done.